The third part of The Middle-Earth Trilogy (also called the Colossal Trilogy). When it was re-released as part of the Jewels of Darkness package, all references to Tolkien were removed. 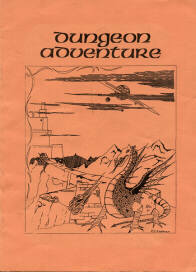 The cover scan at the top of the page is from the first manual for the game. There were many other covers for the game during the years. Please contact me if you can help with scanning one or more. The starting locations of the two ZX Spectrum versions: the original and the one in Jewels of Darkness.